Ireland now has no chance of a white Christmas, with December 25 set to prove mild with a combination of sunshine, showers and strong winds in coastal areas. Shoppers and commuters were warned to expect further blustery conditions over this week – with heavy rain likely on Thursday night into Friday morning. However, the beginning of the Christmas travel rush will be eased by the fact commuters won’t face any ice, snow or heavy frost, with temperatures only sinking to between 3C and 5C by night and with daytime highs of up to 10C. 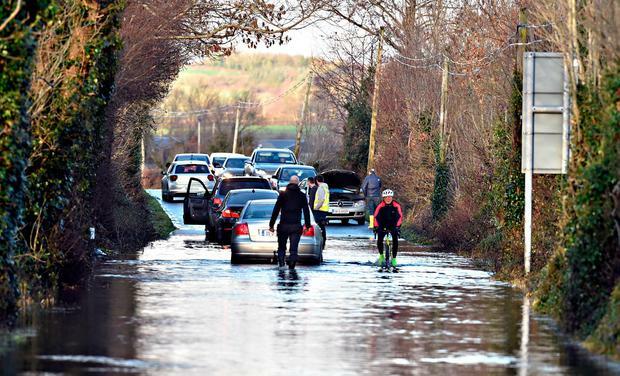 Stormy conditions did cause travel misery yesterday with the east and south-east bearing the brunt of the torrential rainfall and high winds, the second in 48 hours after Storm Deirdre. More than 6,000 homes lost power with the worst hit areas including Wicklow, Carlow and north Kilkenny. ESB crews were working from early morning to repair power lines. Two Status Yellow warnings were in place for torrential rainfall and for damaging wind gusts. Extreme sea conditions also sparked a major rescue operation off Scotland when six articulated lorries on a P&O ferry arriving from Northern Ireland overturned on the vehicle deck.